“Rehab Tickets” Fundraising Campaign 2019 will be held from 1 February to 31 March. 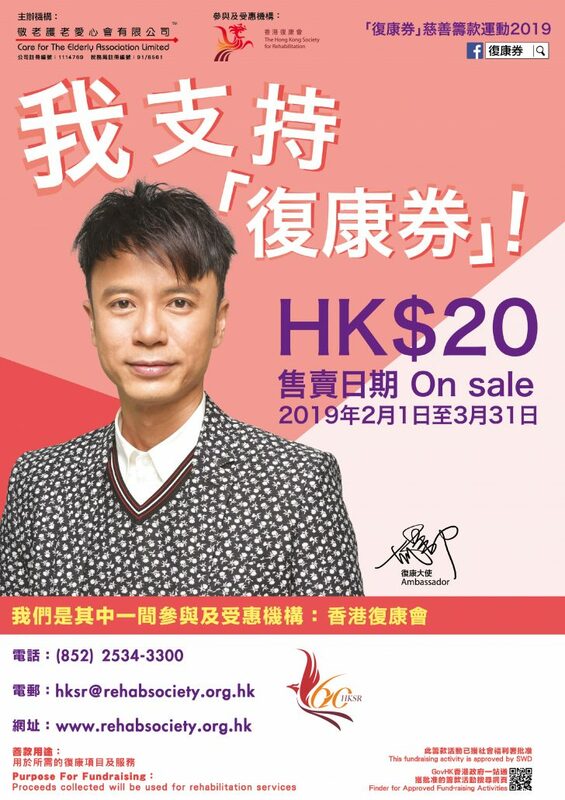 The tickets, HK$20 each, will be available for sale at all HKSR centers and social enterprises. They can also be purchased through completing the order form. With the rapidly ageing population, the number of persons with chronic diseases and disabilities is soaring continuously. The increasing prevalence rate of elderly with disabilities results in a heavy burden in rehabilitation service. Therefore, the Care for The Elderly Association organizes “Rehab Tickets” Fundraising Campaign to help rehabilitation organisation and patient self help groups to raise fund for development. HKSR is one of the participating organisations. The proceeds will be used to develop non-government-subvented services to provide a more suitable living environment for persons with disabilities and chronic diseases. We hope to support them on their lengthy rehabilitation road! Cash coupons with value over $50 will come with each “Rehab Ticket”. We look forward to your enthusiastic support! Learn more about the location of HKSR centers and social entreprises; or download “Rehab Ticket” order form (Chinese only).